We had another family reunion this past weekend. This one is just with Jarom's immediate family. We had a great time enjoying good food (a must!) 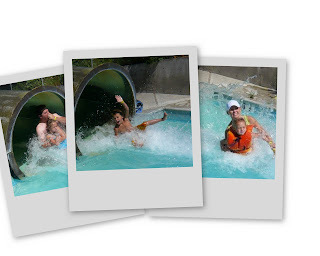 and swimming at Heise. The "dragon slide" was a blast for everyone (except Carter and Owen who refused) and even Kate loved it. Amber, Natalie, and Missy getting a tan on their legs. After swimming we went back to my in law's and played several fun games. One was the flour game where the loser had to remove a dime from a pile of flour with their teeth. Of course, in true Manwaring form, it didn't stay innocent for long. 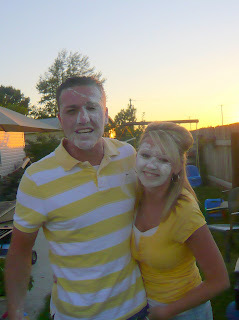 Before we knew it, it was a full on flour face dunking war. Everyone was covered in flour. Such a great laugh it was! I'm sad I didn't get my camera out to get pictures of it. Way to go Brandon and Emily for hosting such a fun reunion this year!! Brandon spent countless hours on a family video/slide show and we all enjoyed it so much! Can't wait until next year's reunion. Natalie get geared up!!! Oooooh, so fun. Good swimming everyone....and YOU Elena MUST show me a dive next year! NO....a back flip off of the diving board. If you do that, I'll....hmmmmm....I don't think I have anything to match. THAT feat would be spectacular coming from you. Miki- Not on you life. ;) I can't even sit on the egde of the pool and go in head first, there's no way I'd dive off the board. Let alone back flip off it. ARe you crazy? So glad you had so much fun! I love me a fun reunion....great memories to last a life time. Oh, and I can't dive either. Not even from my knees. My head just doesn't go first. This is probably Steve's favorite way to make fun of me. He just doesn't understand how someone couldn't dive. Glad I have company. i didn't know ogden was going of the diving board! my word! and alyssa has great form in those diving pictures. what a fun weekend! 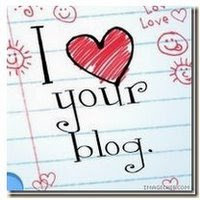 Holy cow, I am SO FAR BEHIND on my blog comments! UGH! So, here is one big one! That night noise story freaked me out!! Your girls are hilarious, but I would have panicked if I hadn't seen that note! Chris doesn't get home until after dark ever, and every now and then, I let my mind wander and come up with all sorts of freaky scenerios... anyway, your story reminded me way too much of stuff I dream up when I'm all alone. SCARY. I'm glad it was nothing!! And way to go Alyssa! You look like a GREAT diver! 10 points for originality! Looks like fun!! 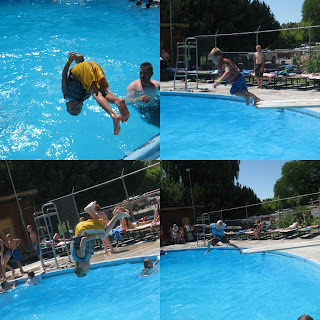 Not only can I not DIVE, I can't even swim, though i can make it look like I am swimming because I am tall, and I just tippie toe across the deep end. are you ok elena? I'm assuming busy with back to school preperations, but I haven't heard comments from you for 2 or 3 days now, which is FOREVER for you :)! How fun! It's probably a good thing you didn't have your camera out for the flour flinging...no telling what it might have done to your camera. I keep reading all these cool family reunion posts. And the only time my family tends to get together is for funerals. We need to figure something out. What an awesome party for an awesome family!